Ghost Bikes are small and somber memorials for bicyclists who are killed or hit on the street. 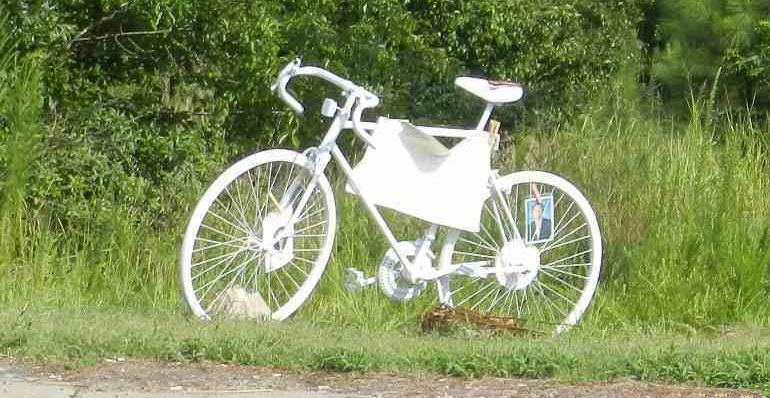 A bicycle is painted all white and placed near the crash site, typically accompanied by a small plaque. They are their to remind motorists to share the road. I was driving down an old familiar road when I noticed an all white, ten-speed bike parked just off of the soft shoulder of the lane. Wow, I thought, that is a creepy looking bike — it looked like a ghost! I had never seen this riderless white bicycle there in all the other times I’d driven past this spot. It was haunting. Then I remembered a story I’d seen on the news a few weeks beforehand about a doctor who’d been hit and killed by a truck while riding his bike. I quickly realized this must be a memorial for him. After a quick Google search, I became familiar with a new term; Ghost Bike. Ghost bikes are typically old bicycles that are spray painted white and left at the scene of the motor vehicle accident where a bicyclist was killed. They serve as a memorial to the accident victim — as well as a message to the community that cyclists should be entitled to the same safe traveling conditions as drivers. Motorists need to be reminded to share the road. How can we avoid these sad reminders? One common mistake some drivers make is not checking for cyclists when turning at intersections. Likewise, cyclists always need to make eye contact with drivers to ensure the motorist plans on stopping. Even bike lanes aren’t always safe, as driver’s don’t always respect that little white line. Bicyclists need to always be aware of cars, whether they are moving or parked. Bicyclists are often thrown off their bikes when drivers suddenly pull away from the curb. While many cycling accidents are the result of negligent drivers, riding defensively may reduce a bicyclist’s risk of being struck. Riding a bike should be a fun, safe activity. It’s healthy for your body and the environment as well. But motorists and cyclists need to learn better road safety and driving communication. Raleigh doesn’t need any more creepy ghost bikes. 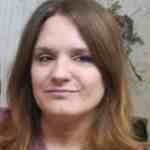 Libby is a native of Raleigh, photography enthusiast, and kindness advocate. All my articles.